There is nothing better then good old fashioned cornbread like my grandmother and my mom cooked it! This cornbread recipe is great whether you cook it in a Iron Skillet (like my grandmother) or 9×13 pan (like my mom). I do it both ways but most of the time I tend to cook it in the Iron skillet. My dad always saves some to eat later for dessert crumbled in a glass of milk or buttermilk. When he was a child that was a real treat and he loves it to this day! HEAT oven to 450°F. If using Iron skillet coat with Crisco shortening (or any all-vegetable Shortening) and place skillet in oven to heat 7 to 8 minutes or until hot. 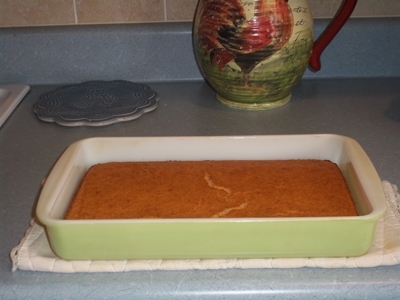 If using 9×13 baking pan spray with no-stick cooking spray. Beat egg in medium bowl. Stir in milk, vegetable oil and corn meal and mix until smooth. Batter should be creamy and pourable. If it is too think you can add 1 or 2 tablespoons more milk. Pour into prepared Iron skillet or 9×13 pan.